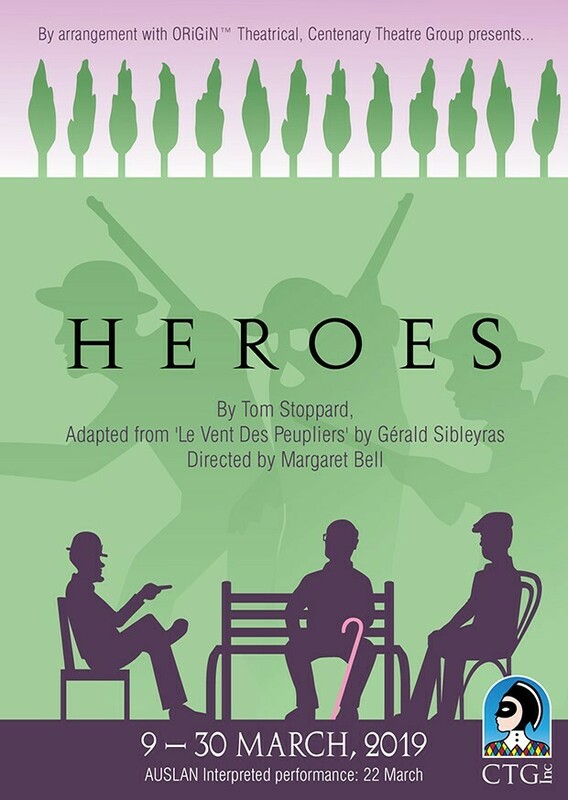 Heroes is Tom Stoppard's 2005 adaptation of the French play, Le Vent des Peupliers' (The Wind in the Poplars), written by Gerald Sibleyras, and winner of the Laurence Olivier Award for Best New Comedy in 2006. 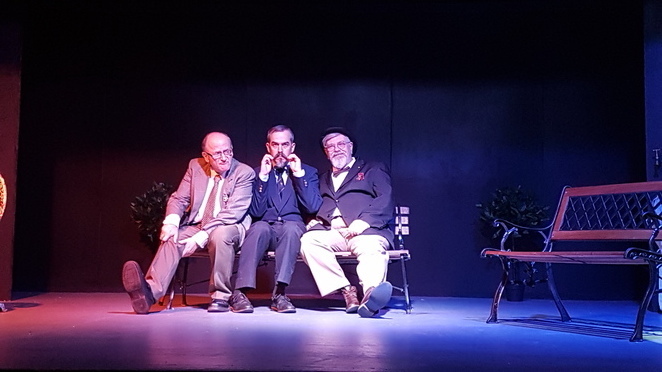 1959 is a troubled year in the life of three elderly First World War veterans: Gustave, Philippe and Henri, frustrated with being stuck in a retirement home like forgotten cast offs. The three war heroes band together against the tyranny of the nuns, especially Sister Madeleine, who runs the home with the ferocity of the Gulag, …or so they see it. The four comrades, now that Max the dog statue has been enlisted, hide out on the patio confiding in their exploits, and bemoaning life "inside." Eventually, a conspiratorial plot is hatched to evade the Nuns at dawn and escape to Indochina, or perhaps, just to climb the distant hill of poplars and feel the wind in their thinning hair. Philippe (Andrew Wallace) is the oldest inmate, tolerating over 10 years of hardship. With a tendency to faint at inappropriate times due to a stray bit of shrapnel and uncontrollable paranoia, he is more of a willing follower than a leader. Andrew is hilarious with his well-timed faints; he collapses and slumps in all manner of positions throughout the show, often missing the most pertinent parts of the plans. Cam Castles portrays Gustav as a pompous megalomanic and the self-appointed leader of the tribe. He is all bluster, once it is revealed he is a chronic agoraphobic. His first step is to endeavour to take a constitutional to the local girls school with the limping lecherous Henri, played convincingly by Gary Kilger. Henri fantasises over the uniformed girls, whilst imagining he is having a clandestine romance with the saucy schoolteacher. The French humour is peppered throughout with a poignant observation on the trials associated with ageing. The set design by Tristan Holland and Director Margaret Bell is simple, but effective, featuring the unassuming dog statue, Max, who was seconded from The Queensland Theatre by Margaret. She first spotted him in the role in 2007 and secretly planned to trot him out with the CTG in the future. Only Philippe sees Max for his true potential, obsessed with how he "follows" him around the patio. If you're observant you may just catch him in the act!